That’s where Deb Krier comes in. Twice a week, she talks with experts in a variety of business fields, as they share the latest trends, up and coming changes as well as best practices. Her program airs live every Monday and Thursday, 11:00-Noon (ET), on Mile Hi Radio. Originally focusing on social media but now expanded to cover many business topics, Deb’s program is one of the most-listened to programs on Mile Hi Radio. Her guests have included Bob Burg, Jeffrey Hayzlett, Andrea Vahl, Peter Shankman, Joel Comm, Phyllis Khare, Wayne Breitbarth, Viveka von Rosen, Gina Carr, Terry Brock, Mike O’Neill, Lori Ruff and many other fabulous business experts and professionals. 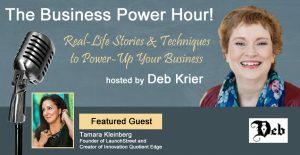 The Business Power Hour interviews Tamara Kleinberg Part 2. Deb and Tamara talk about how to be innovative and dive into Deb's Innovative Quotient Edge.